If you start to play tennis, the hope is that you’ll soon enough come under the influence of someone who can help you understand tennis in a deep way, someone who will show you not just how to hit the ball, but to richly grasp the sport. The one I was lucky to meet, Tony Trabert, turns 87 today. His tennis resume is significant: 10 Grand Slam titles, including 5 singles titles. Most notable was Trabert’s 1955 campaign, a year where he won Roland Garros, Wimbledon and the US Championships (the latter two without the loss of a set). Along with his doubles partner, Vic Seixas, Trabert led the United States to the Davis Cup title in 1954. He was also a barnstorming pro, Davis Cup captain, CBS analyst for 30 years and, most recently, president of the International Tennis Hall of Fame. But beyond those exceptional public achievements, I’d like to give you a personal insight into Tony. 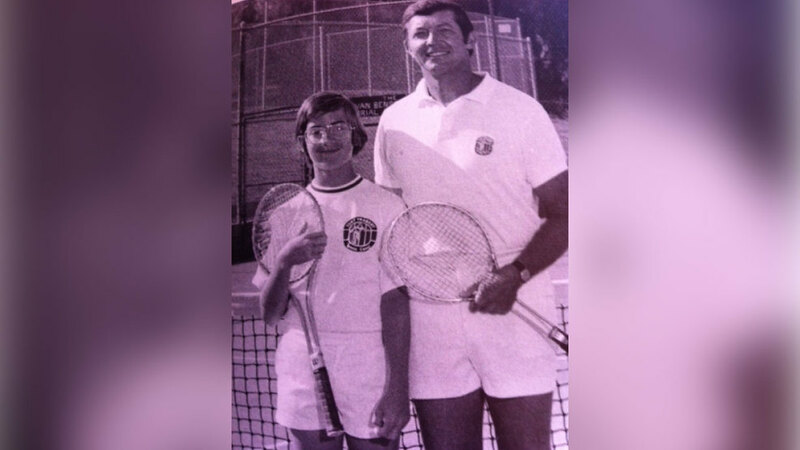 In the spring of 1972, I was eleven years old and had been playing tennis for four months. My parents thought it might be helpful to send me to a tennis camp. This was light years before the existence of fast-track tennis academies. Tennis camps then – as many are now – were a mix of specialization and more classic camp activities such as softball, dances and the usual mid-summer night dreams and schemes you’d expect to see among reasonably privileged adolescents. These were tennis’ boom years, when many great players put their name on tennis camps. And since we lived in Los Angeles, many of those camps were nearby. One camp featured an active great. But then we learned that the icon was on-site only one day a session. Another starred a recently retired legend. Word had it that this person was rather mean to campers. And then there was this ad: “One thing you always see at Tony Trabert Tennis Camp is Tony Trabert.” Off I went. Tony had a different vision. “Looks like another Rod Laver,” he said. With trademark logic, he told me why lefties were advantaged. As he easily demonstrated the slice serve, he suggested that as long as the receiver’s left foot wasn’t touching the ad court sideline, I should serve wide (years later, it was pretty cool to hear Tony tell me that he gave the same advice to John McEnroe during Davis Cup matches). Tony’s logical wisdom flowed. Come to net and force your opponent to hit a tough shot. In doubles, plant seeds early on with lobs and occasional drives down the alley. Don’t muscle the ball; let your shoulders and hips do the work. If the guy can’t hurt you with his service return, take off speed and get in a lot of first serves. What was even more amazing was that these were the exact comments Tony would make when he started to become CBS’ lead analyst on its coverage of the US Open and other tournaments. After four summers at camp, my era as a camper had ended. But even that at the age of 15, I knew I wanted to work for Tony. He said you’d have to be 20 years old. Thus began a five-year campaign of intermittent letters and visits. In 1978, having driven from Los Angeles to New York to attend my first U.S. Open, Tony waved me into the CBS booth and let me enjoy the view. A year later, he invited me to apply for a job at the camp. The interview included a hit with Tony, which I nervously prepared for by reminding myself to move my feet and drive through the ball on every backhand. To work for Tony Trabert was delightful. With the same precision and simplicity he brought to technique and tactics, Tony boiled down our responsibilities and helped his staff thrive. One jerky counselor constantly claimed he could perform greater feats than any of us. If I’d spent one hour with camper, he’d say he spent two. And so on. Tony’s advice was simple: “Don’t try to win a smelling contest with a skunk.” The principle proved wise for wrestling with tennis’ many odious handlers. But Tony and I both knew that as much as I loved tennis, it was not what I could do with my racquet that would help me find a place in the tennis. As I sat in his house during camp, he’d show me the media guides he studied for his work with CBS and explain how he talked about the game to people who weren’t as familiar with tennis. We’d talk about the experience of interviewing such greats as Martina Navratilova and Chris Evert, Jimmy Connors and Bjorn Borg. The journalistic battles I’ve waged at pro tournaments were first won in Tony Trabert’s living room. Tony laughed the heartiest of laughs.